Safe, cosy, suburban, whimsical… words to desribe a great many British 70s sitcoms. Rising Damp doesn’t fall in any of these categories. 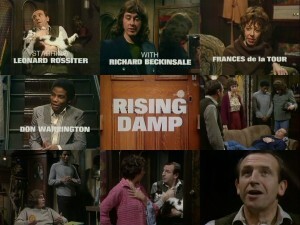 Rising Damp was set in the bedsitland of a bleak Northern city and centred around miserly Landlord Rigsby (played by Leonard Rossiter) and his eclectic tenants spinster Miss Jones (Frances De La Tour, supposed son of an African Tribe Leader Philip (Don Warrington) and naive medical stundent Alan (Richard Beckinsale). Rising Damp started life as a 1973 stage play called The Banana Box written by Eric Chappell starring Leonard, Frances and Don. The cast of the theatre production would resurface in the pilot episode Rooksby in September 1974 when Yorkshire Television would commission a full series later that year. Leonard’s character would undergo a name change from Rooskby to Rigsby and Frances and Don would be joined by Richard Beckinsale playing Alan. Eric Chappell’s characters were all hopeless people we could all sympathise with whether it was Rigsby’s failed attempts to bed Miss Jones, Miss Jones’ failed attempts to bed Philip and Alan’s failed attempts to bed anyone. It was a classic scenario with elements of generation conflicts, Rigsby’s disgust with the permissive society (mainly due to his inhability to join it ! ), cultural conflicts with the ethic character Philip (always treated with responsibilty) and the endless comic situations and dialogue they generated. It lasted for four series between 1974 and 1978 with a feature film following in 1980. 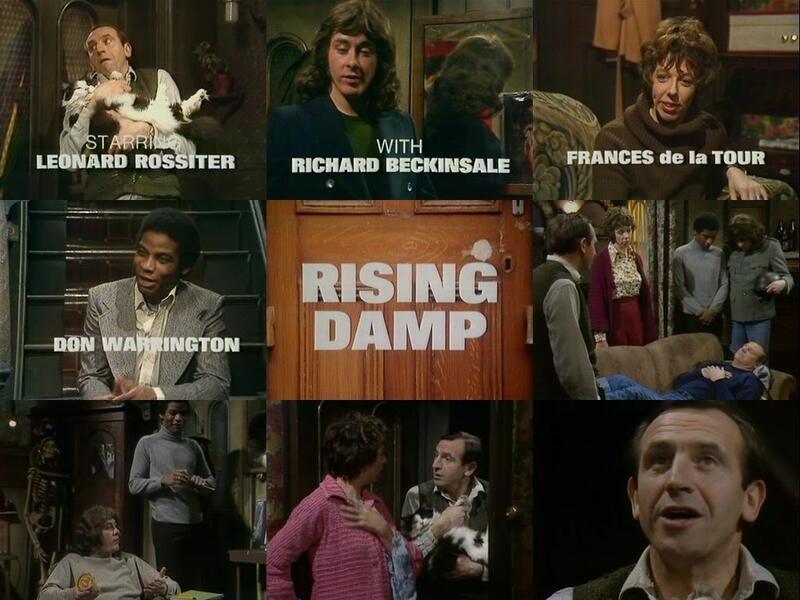 Rising Damp is still regularly repeated on British TV and fans now have a dedicated forum http://risingdamp.megabb.com to discuss their favourite series. This entry was posted on Tuesday, May 8th, 2012 at 12:10 am	and is filed under TV - Comedy. You can follow any responses to this entry through the RSS 2.0 feed.